Embark on a 2.5-hour cemetery and ghost tour by bus to see the "Cities Of The Dead." 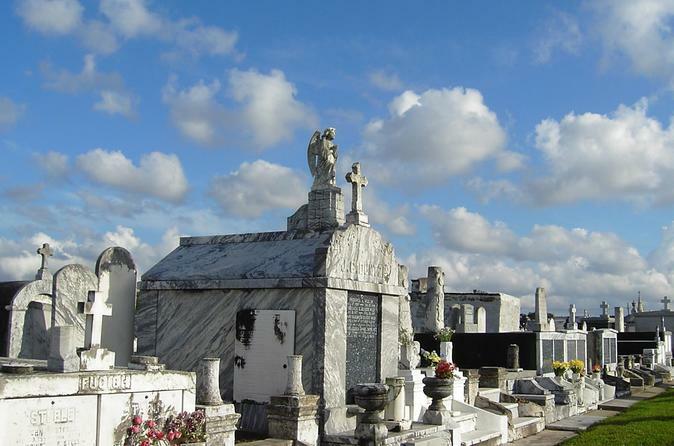 New Orleans has 42 cemeteries, explore multiple cemeteries with a friendly and professional guide. Listen to unique burial rituals and practices while getting up close and personal. Explore Charity Hospital Cemetery, which was a potter’s field and now is home to the “Katrina Memorial.” Visit Holt Cemetery, primarily indigent, consisted of homemade tombstones and memorials on an air-conditioned minibus. Enjoy live commentary on-board as you take home everlasting, haunted memories. Begin your marvelous adventure with your driver and professional guide at 8pm. Pickup commences at 7:40pm so you can venture into an array of New Orleans cemeteries as you leave the French Quarter behind. Relax as your bus creeps along Esplanade Avenue. Travel to what used to be the edge of town, currently known as the bustling neighborhoods of Mid-City and City Park. Venture into Charity Hospital Cemetery, Home of the Katrina Memorial. Relax as you travel to haunted neighborhoods in New Orleans, which is 300 years old. Next, visit Holt Cemetery, originally established in 1879 for poverty-stricken residents, and also famous jazz musicians later on. Enjoy stops at multiple cemeteries with your guide to learn why these historical places are called the cities of the dead. Relax during your 10-15 minute stop at City Park Morning Call for refreshments and a restroom break. After your haunted journey has ended, relax as you're driven back to the meeting point.